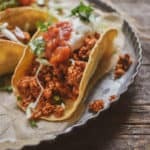 Cauliflower Mushroom Walnut Vegan Taco meat. Easy, delicious, healthy and ready in as little as 20 minutes. Put all ingredients in a food processor and pulse until you get a “ground beef consistency and everything is well combined. Pour mixture into skillet and cook for 5-10 minutes, stirring occasionally. Reduce heat to low-medium and cook for another 10-12 minutes, stirring occasionally. Taste and season as you go in order to fit your taste. Remove from heat and build tacos with corn or flour tortillas and favorite toppings. Nutrition info is for the taco meat only. If you’re worried about the fat content you can just leave out the walnuts. It’s still great! This recipe was adapted from Pinch of Yum’s Cauliflower Taco Meat.